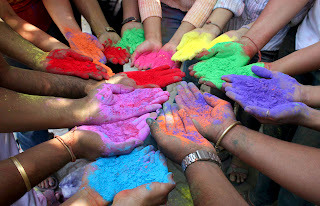 India celebrates Holi, a festival of colours, with extraordinary energy which begins when individuals of all age gathers and plays with vibrant colours. Whole nation commends and wears a happy brilliant look throughout Holi. But sometimes we try to limit ourselves because of hazardous chemicals in holi powders which are unsafe to eyes, skin and hair. Be that as it may you can delight in this time to the full degree as the amusement changer Fitness Beauty Plus will impart a few plans on the best way to make custom made holi colours that can be easily made at home as well. Orange Colour – Soak grated carrots in boiling water and leave overnight to get the orange colour. Magenta Colour – In the boiling water add grated beetroot or peels of onions to get the light magenta colour. Red Colour - You can make use of pooja red tilak / sindoor for making the red water colour. Another way is to soak the dried rose petal in the warm water to get the desired colour. Grind the pomegrante peels, carrots peels and tomatoes to the smooth paste. Add it in the water to get red colour. Brown Colour – Boil tea or coffee leaves in water to get dark brown shade. Purple Colour – Soak grated black grapes and gooseberries in boiling water and leave overnight. Green Colour – Soak spinach, coriander leaves and mint leaves in boiling water. Even henna powder when mixed with water gives you nice greenish orange colour. Blue Colour – Boil leaves of Indigo plant to get rich blue colour. Black Colour – Boiling dried fruits of amla gives you black colour. Light Yellow Colour – Mix turmeric powder with water to make yellow colour. Dark Yellow Colour – Mix 4 tsp gram flour (besan) with 2 tsp turmeric powder and mix it in water. Saffron Colour – Add sandalwood powder, turmeric with rose water to make this Colour. Add enough of water to increase the quantity as required. Violet Colour – Mix grated red cabbage in boiling water for this colour. Yellow Colour – Mix turmeric with besan or multani mitti powder to get the bright yellow Colour. Red Colour – Add red sandalwood powder, crushed hibiscus flowers with wheat flour or maida. You can also make use of natural sindoor or pooja tilak mixture. Blue Colour– Crush dried jacaranda flowers or blue hibiscus and mix with wheat flour. Black Colour – Use the dry kajal powder as black Colour. Pink Colour – Mix Red Sandal with wheat flour to get the pink Colour. You can revel in this Holi without being cruel to yourself by utilizing characteristic holi shades as they are relatively more secure. Included point of interest is that a percentage of the elements are handy for skin. Use it in water balloons or pichkari for the persevering fun. Do keep away from it assuming that you are allergenic to any fixing or experience the ill effects of any rashes. Do share via comments on how are you planning to play this holi?